With his impeccable sense of style, slick rhymes and signature wrap-around sunglasses, Kool Moe Dee was one of hip-hop's first bonafide superstars. Though many now know him mainly for his long-running battle with LL Cool J, Moe Dee, who's career started as a member of The Treacherous Three in the late 70s, helped establish a new benchmark for rappers in the 1980s: moving away from the roots of the party-rocking emcee and opening the door for experimental flows and complex lyricism to become part of the hip-hop lexicon, he also became the first rapper to perform at the Grammy Awards. His debut album Kool Moe Dee shows all sides of the artist; the storyteller with an eye for detail (''Little John''), the socially conscious poet (''Monster Crack,'' ''Go See the Doctor'') and the songwriter capable of penning a smash hit record like ''Do You Know What Time It Is?'' 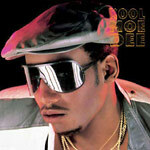 With the assistance of producer Teddy Riley (Guy, Michael Jackson), Kool Moe Dee crafts an unforgettable, timeless debut which Traffic Entertainment Group, in partnership with Sony Music, is proud to present in this special reissue, featuring audio remastered from the original analog tapes, a bonus track previously only available on 12'' vinyl and packaged in a six-panel digi-pak case.